Recently our Berber Treasures Morocco Tours Director & Head of Operations & Tours, Morocco joined the Ambassador of Morocco His Excellency Mr Mohamed Mael-Ainin at the University of New England for a 3 day study program on Morocco. Berber Treasures Morocco recently had a wonderful time participating with the Ambassador of Morocco, His Excellency Mr Mohamed Mael-Ainin, other members of Australia’s Moroccan community, the University of New England and members of the NSW branch of the Country Women’s Association in the Morocco study program (University of New England, Armidale 1-3 February). 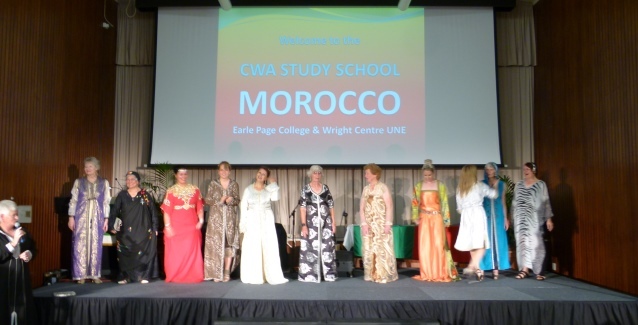 Each year the CWA chooses a country of study and this year it is Morocco. 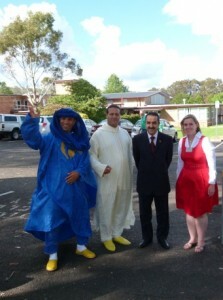 In February the University of New England sponsored and hosted the 3 day study program at their Armidale campus putting together a terrifically interesting program showcasing many aspects of Morocco including its history, countryside, people, culture, cuisine, and the unforgettable sights of Morocco. As Australia’s leading Morocco/Australia based specialist Morocco tours operator when the University approached Berber Treasures Morocco late last year and asked us to participate in and present at the February Morocco study weekend we were, of course, delighted to accept the invitation.The University and CWA members warmly welcomed us with a dinner on Friday night. On Saturday the formal study part of the school began with His Excellency Mr Mohamed Mael-Ainin the Ambassador of Morocco providing an engaging and informative overview of Morocco. 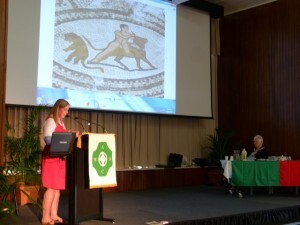 B erber Treasures Morocco Director Georgina Hayden who is in charge of developing new itineraries for our Morocco tours spoke about the Roman Empire in Morocco highlighting some of Morocco’s Roman settlements including the Roman capitals of Volubilis and Tingis (Tangier) and the western most outpost of the Roman Empire, Sala Collonia (at Rabat); the ancient trade routes the incredible trans-Sahara camel caravans followed through the towns and cities of Morocco including Sijilmasa, the legendary city of gold, along the Road of a Thousand Kasbahs to the desert Kasbah villages of Ouarzazate and Ait Benhaddou over the High Atlas Mountains via Telouet to the great trade centres and imperial cities of Marrakech and to Fez, the Port of Timbuktu (Essaouira) and onto Chefchaouen in the Rif Mountains and Tangier; and Morocco during the European Age of Discovery when Moulay Ismail established his new imperial capital at Meknes in the 17th century. We were fortunate enough to be able to have members of our Moroccan staff visit us in Australia and join us at the University of New England including our Head of Operations & Tours in Morocco and one of our senior driver guides. The CWA members heard a very personal experience of the life of a Berber nomad in the Moroccan Sahara Desert. This unique insight into the lifestyle, traditions and culture of Morocco’s Berber nomad tribes was fascinating. We learned about how the nomads navigate through the desert, the different tribes, their traditional clothing and the practicalities of the flowing indigo blue robes and shesh worn by the men, the tribal decorations on the black legnaa worn by the women, the importance of dates and camel milk, traditional medicines, the 5 day Berber marriage ceremonies, the Berber Amazighe language and alphabet and so many more interesting aspects of the Berber nomads’ life. Professor Jeanette Hoom of the University of Melbourne shared the story and paintings of Hilda Rix an early 20th century Australian painter who captured her Morocco travel experiences in some of her paintings. 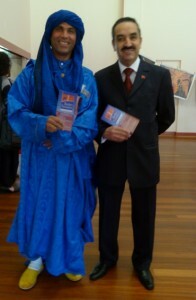 Dr Soufiane Boufous of the University of New South Wales told us about the beautiful, spiritual Gnawa Moroccan music. We were entertained by a fashion show of gorgeous Moroccan traditional and contemporary kaftans designed by two talented Australian Moroccan women and authentic Moroccan music. What a treat and this was just some of the wonderful Saturday program with much more to come on Sunday. It was a terrific event. We at Berber Treasures Morocco loved sharing our passion for and knowledge of Morocco with all the study school participants. 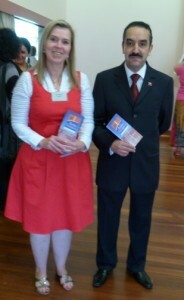 Thank you again to the University of New England, and in particular the energetic Sharon Gallen who planned and coordinated the study program, the delightful members and guests of the CWA for their eager audience and generous and participation, and His Excellency Mr Mohamed Mael-Ainin the Ambassador of Morocco and his Deputy Mr Abdelkader Jamoussi and all of the other speakers and presenters at the study weekend who contributed to a truly tremendous Moroccan experience. Join us on one of our Berber Treasures Morocco tours of Morocco. You can explore Morocco’s wonderfully diverse countryside and culture as well as medieval cities, old pirate ports and kasbahs of Morocco. Australia’s leading Morocco-Australia based Moroccan specialist tour operator – conducting unique small group tours of Morocco and customised individual private tours of Morocco. We are Morocco travel experts. group tours of Morocco and customised individual private tours of Morocco.